TED - TANGO ELECTRIC DRIVE: With compatible systems, eg TED (available from www.casu.tv) the system will ramp down at the ends of the track automatically, irrespective of length, without the need for user intervention or pre-calibration. SHOT-BOX POSITION MEMORY: There are 4 available "1-touch" motor position memories. The motor will drive to the selected position with user-selectable ramp-up, ramp-down and speed settings. Positions are saved to memory for future recall*. POSITION LOOP PLAYBACK: Position memories can be played back as a loop (0-9 or continuously) with the choice of memories (1-2, 1-3 or 1-4) and 2-59 seconds, or 1-60 minutes delay at each position (with software version BC+). 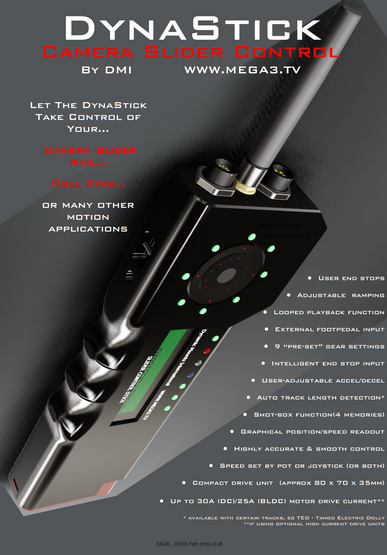 OPTIONS: Currently the "standard" kit has a 10m RS-485 control cable - Options include RF link, batteries for the control stick (for RF use) etc, programer / drive battery backup (to keep endstops, position etc for extended period - now not req'd). *Shot memories are stored relative to track auomatic end stops, which must be set before positions are automatically re-instated. LEFT VIDEO: Note change of arrows under "ES" as limits are set. 2nd top LED flashes when at limits. RIGHT VIDEO: The "--" on the display is when no limits are set. <- shows 1 limit is set, <> is both limits set (<< or >> means limits reached, along with flashing limits LED) - When both limits are set, the display changes to show position between limits. Position readout on ProSup Tango slider (TED).